Grandmother Flordemayo will be sharing insights into how to decipher and work with this ancient wisdom on Wednesday, March 21, in a special online event: Discovering Universal Wisdom From The Mayan Calendar: How to Align with Cosmic Forces to Navigate Your Life With Vision, Truth & Love. 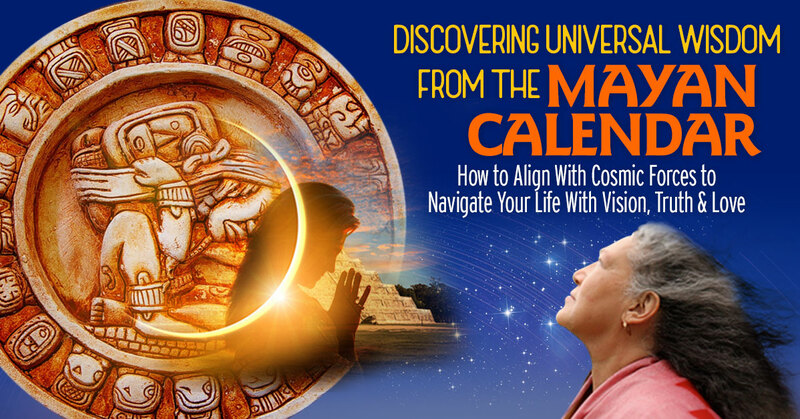 • You can look to the Mayan calendar to access when it’s best to undertake particular creative projects, undergo surgery, or when to have a wedding or hold a celebration of life. Or to understand why your life seems out of control on a particular day — and to choose a better day to complete your tasks with greater ease. • On a deeper level, the Mayan calendar offers us a philosophy of life, a way of understanding the universe, our experiences, and our lives.